Rarely, when I watch a movie does the audience applaud, but today after Son of God, the crowd was more than happy to show their respect. I was captivated by the man who played Jesus. His eyes had me at hello and even though I knew how the story was going to end, I sat quietly in my chair and secretly hoped it would end another way. I feel many things after this particular film and I have many thoughts. In some ways I believe the world has not changed a bit. Although many years have passed and technology has become more and more advanced, I believe as a people, we haven’t advanced in our own growth. There are lessons, that for one reason or another, we just haven’t seemed to learn. It’s hard to admit that we engage in actions and words that knowingly strip someone of his or her dignity. It is hard to admit when we disagree with someone’s beliefs we celebrate their misfortune. And it’s most hard to believe that when someone needs our love and support most, we forsaken them. We see people need our help and yet we often choose to do nothing. We jump in defense of someone who doesn’t deserve our admiration and respect while we stand there watching someone scream out in pain. Power in numbers, that’s what they say. But what happens when a number of people look the other way? Ive learned that we all have a cross we carry through this life. No-one can carry it for us and I believe no-one would even if they could. People will turn and look away when the world around us becomes heavy, but Jesus reminds us to have a forgiving heart and to not cast stones at someone unless we have never committed a sin ourselves. He always sides for peace and not criticism, hate, blame or revenge. My eyes are open and I am going to try very hard to follow his way. I will remind myself that I am one of many and I have to stop my human urges for power and control. I am not always right and admit I am somewhat clouded by the real picture that becomes tainted by my human vision. We are all flawed and who do we think we are to look down upon or judge another. Don’t mistaken this for choosing on the side of right or making a stance. I believe that is a test of our character during our short lives. What do we do when no-one is watching and more importantly, what do we do when everyone’s watching? Do we fight for another’s dignity or do we hide behind our fear of not wanting to get involved? Do we stand up and fight for the good of fellow human beings when everyone is screaming at us to sit down? We have a choice, a free will and it is how we choose to use that free will that brings us closer to God or drives us further away. We must be more respectful and compassionate and kind to one another the way we were meant to be. We must be an example to those around us that are a different level of spiritual growth. I believe we are not here to change the world but perhaps the pattern of behavior that has plagued our souls for hundreds of years. I believe we are here to learn and know better and do better instead of looking the other way and repeating the same mistakes. We must hold ourselves accountable for our words and actions if we believe there is a shred of evidence that God really does exist. We must hold ourselves to a higher standard of human interaction if we are to break out of the chains that have bound us for years and years. We must quiet our minds and our mouths and learn to think and speak with our hearts. We must do better. We must be better and not accept excuses to be anything less than the person we know we can be. I loved the movie and it is worth checking out. There are so many important reminders and important lessons one can take away. But more than anything, it was a captivating story and one that will stay with me always. How will you start your day today? Will your mind race over the millions of tasks that lie ahead of you or will it start with thoughts of gratitude for everything you’re thankful for? You might be thinking, I don’t feel very thankful today, but if you look deep enough, you will see that list is there waiting to be acknowledged. Start simple like acknowledging your comfortable bed, warm house, someone to wake up next to. Be grateful you were given another day to get this thing called life right, a chance to be better than you were the day before. Notice the little things, like the way the sun sparkles in the reflection of water. Don’t allow the negative thoughts or annoyances to slip in. Distract yourself with the good things all around you. It’s easy to keep sliding downward once you commit to ride the slide. I say it’s much more fun to crawl back up and go outside of the rules a bit. Look for things to be grateful all day long and see how many you can find. If you expect the world to be a horrible place, the world will deliver horrible circumstances but if you expect to find reasons to celebrate, the world will deliver a party. Sometimes we have to tweak our minds, and it’s necessary to utilize the fake it til you make it attitude. Wouldn’t it be a lot more enjoyable to fake being happy then it would be to spread your misery to everyone around you? Even I sometimes forget we do have a choice. We are responsible for the energy we bring into every room we walk in and for the energy we bring to each and every life we briefly touch. Every encounter counts, from the conversations with family to the brief encounter with a worker at the check out counter. Everything we do affects another and the reverse it equally true. We can’t change what happens to us but we can change how we happen to others. We can’t quit on that, for in those few simple words lies power and hope. I am going to give it my best shot to bring positive, happy energy into the world today. I am going to remind myself throughout the day that my energy joins with the energy of others and it DOES make a difference. That is how we change the world. Keeping ourselves in balance and protecting the energy all around us. Will you join me today to make the world a little bit better? I would love the company. As I have followed a story in our local news recently that is slowly gaining media attention all over the world, it occurs to me that somehow the facts get hidden behind a false shield. I have watched the video myself of a man who has lost his life after being restrained by 5 police officers. I heard the pain in the voice of the wife as she screamed “papa, are you okay?”, as I watched his lifeless body lie eerily still. I am not tainted by media or rumors. I base my opinion on the nervous voice of the police officer and what I witnessed with my own eyes. Then I see a disturbing Facebook picture accusing people of forgetting what this courageous police force did in the midst of devastation after the Moore tornado. That is where the facts get blurred. This is not about not supporting a police force but rather is about NOT supporting the actions of a few men that happen to be part of that large force. It saddens me that there is a misconception that people in certain jobs are assumed to be good. NEWSFLASH! The point here is that there are people in every profession that make bad choices and they should not be protected under the falsehood that all police officers are good. There are people that abuse the power that comes along with the title of their job period! Whether it’s a teacher, a nurse, a senator, a coach, there are people that do bad things and make mistakes that there must be consequences for. I have taught my children from the time they were very little that they cannot automatically trust someone because they are an adult, a parent, a teacher, a coach. The fact is people do bad things. Adulthood does not come without flaws and believe me we are all flawed. However, actions have consequences and no-one with any type of power should be allowed to skip out of consequences regardless of the position they hold. Here is the link if you want to check the video out for yourself. We can view the same 6 minutes of footage and still see the situation entirely different ways. I am curious to see what you think. Will You Help or Look the Other Way! I wrote about the Justina Pelletier story last week. What if you could do something simple that would only take a second that could completely change the lives of others? Now is your chance to answer that question. Please call and support this poor girl who has been taken away from her family. 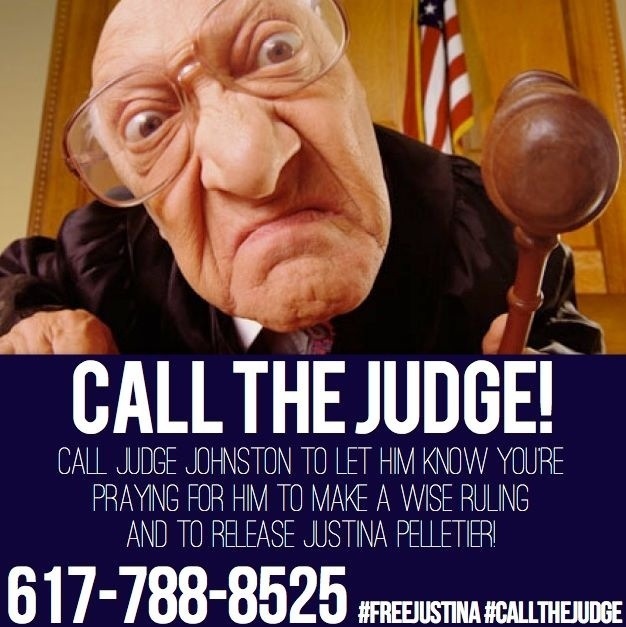 Please call and urge Judge Johnston to let this girl go back home where she belongs. This family desperately needs your help, so I ask again, will you take a second to call? I did! So, I made it my personal goal to share at least one positive story a week. With all the horror stories and heartbreaking news we hear on a daily basis, it is important we read about something good. I found this story by Fox News that reminded me a small act of kindness is not only contagious but does the entire world a whole lot of good. Here is the story as it was written. 14-year-old Will Hart wrote, “Hi Mom. God Bless U,” at the top of the parking garage outside Rush University Medical Center. Shari Hart was diagnosed with leukemia and has been in the hospital since last week. “I thought it would be nice for my mom to see it and for others to feel happy,” Will said. “When I saw what he wrote I was just proud and amazed that you could think of doing something as spectacular as that for me, just outside my window for everyone to see. It was a big proud mommy moment,” said Shari. Nurses say the message has really hit home for cancer patients at the hospital. 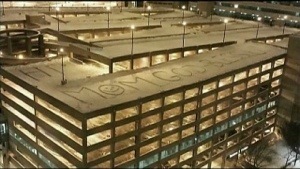 I can’t help but think how I would feel as a patient if I looked out my window and saw this message of love and hope. To think that someone took the time to express their love for the entire side of the hospital to see and the warmth that mother felt in her heart the second she spotted those few sweet words. Imagine not knowing if that message was for you but knowing it was the exact message you needed at just the right time. What a selfless, kind act that can mean so much to the ones that were fortunate enough to look out their window and read those words. What an inspirational, feel good story that’s makes us believe there is so much good in the world if only someone would help us see it. Imagine a news program or segment that only reported the stories that warmed our hearts instead of hardening them. Spread happy. Spread kindness. Spread good news. We all need to hear it once in a while. How Do I Love WordPress? Ahhh…in my mind I am traveling back to a time my body was completely drained and exhausted. We had just arrived in Rome after spending what seemed like days of traveling. We fell into bed and decided to take a nap. I was completely out of it and not sure if I was dreaming of the beautiful sound I heard in the distance or if it was actually real. Slowly, I woke up and walked to the window to open the shutters. The busy street had been transformed as I slept into a romantic square filled with elegant tables with flowers and candlelight and the sound of the Italian accordion could warm even the coldest heart. I stood there for a moment while my heart stopped. I was filled with that beautiful moment and locked it in my memory so I could always revisit it at any time. What a wonderful culture, where life shuts down in the middle of the day for everyone to take a moment of quiet and recharge to get through the rest of the day. What a wonderful culture, where families sit down to eat for hours on end and dinner isn’t really about gulping down your food, but rather enjoying the relaxing atmosphere and conversation with those you love. What a beautiful culture that sits for hours in a small square listening to the sound of classical music and just taking time to be there in the moment while feeling grounded sitting on the hardness of the marble steps beneath you. I remember my days in Rome well and I often ache to be there again. In a world where we barely take time to sit down before we inhale our food and rush off to the next place we need to be, I mourn for those beautiful calm days, where my heart was at peace and my soul felt at home. In a world where people leave for work when the sun comes up and drive home as the sun goes down only to grab a laptop or a phone to text until it is time to go to bed, I can’t help but remember this different pace during those few short days of my life. Those days changed me in ways I can’t explain. I didn’t know life could be so different in a different place. I thought everyone lived the rat race that our American lives have seemed to become. No wonder we are so obese. No wonder we are so depressed. No wonder we are so exhausted. We are so busy we have forgotten how to pause and breathe. How I long for more days like the ones in Rome.